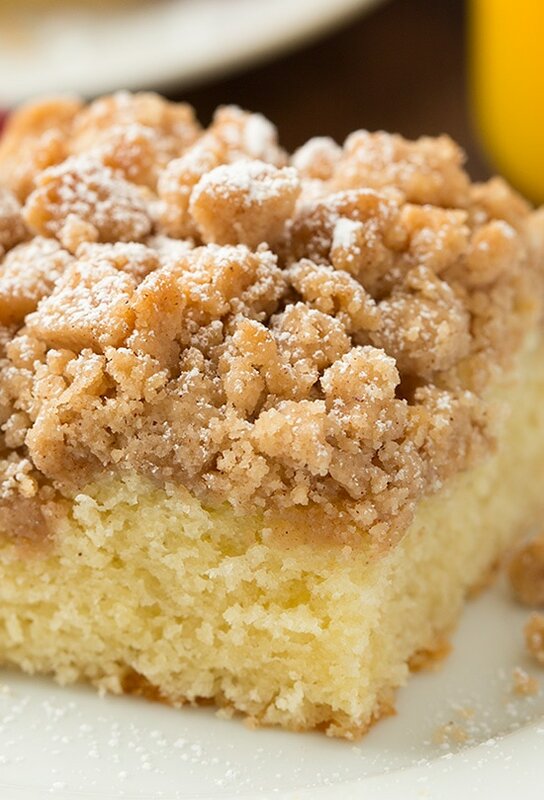 The world needs more crumb cake. 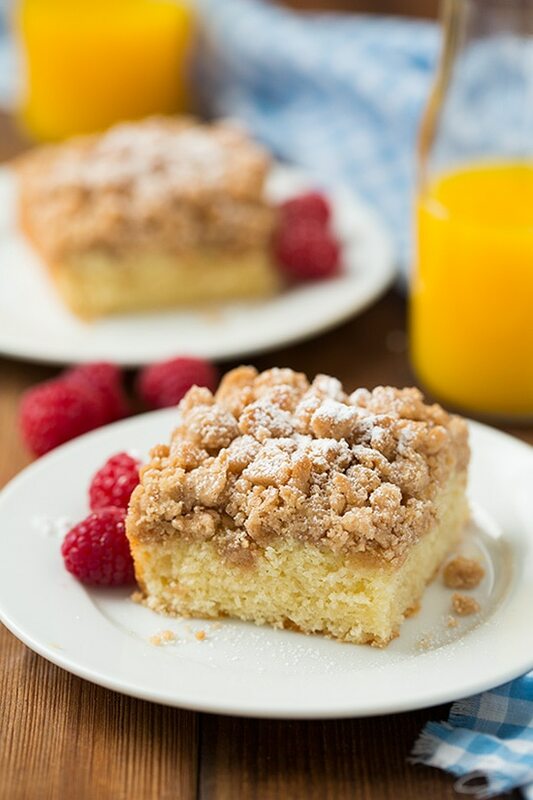 I mean how could your day go wrong if you start it out with a piece of this dreamy and decadent, over-the-top Crumb Cake? How I wish I could have this every day for breakfast. 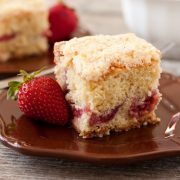 You’ll love then generous layer of crisp, buttery, cinnamon laden crumbs atop that pillowy-soft, moist cake that’s swirled with notes of vanilla and an ever so light tang from the sour cream. 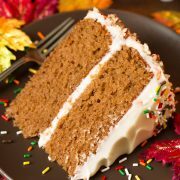 This is one of my favorite breakfast cakes, like ever. I’m a crumbaholic. If it has crumbs I need it, and this is overloaded with them to the max! I just love the contrast of a fluffy cake next to a dense crumbly crumb. 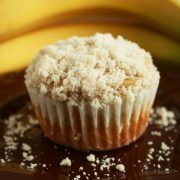 Last year I attempted several times to make a crumb muffin and it just never worked for me because the crumbs would either end up swallowed up by the muffin or all spread out to the edges (which made since because I never used a super tall cupcake liner to keep everything intact). Luckily, things worked out much better in cake form. 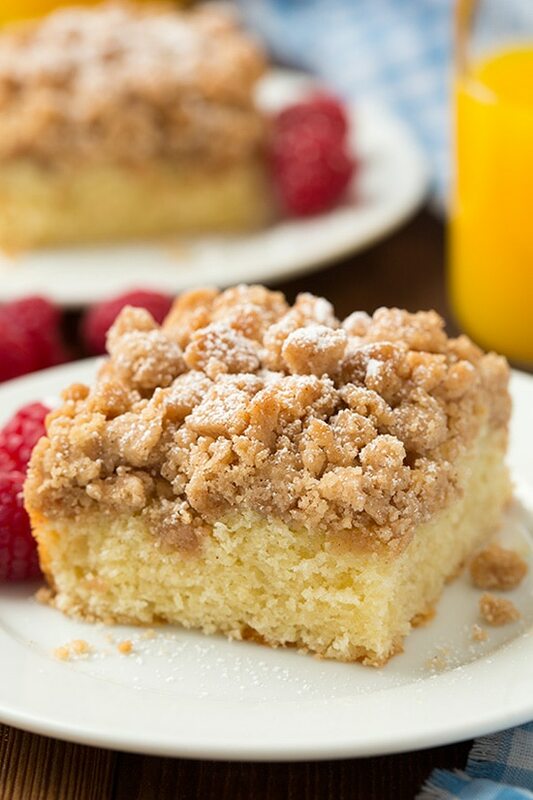 This cake turned out to be the best crumb cake I’ve ever had and I already can’t wait to make it again! 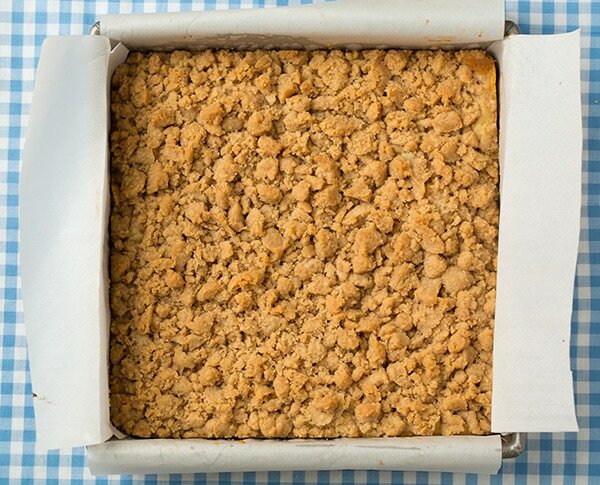 A deliciously soft and tender cake topped with a crisp buttery crumble. Perfect for a weekend breakfast or holiday brunch. Preheat oven to 350 degrees. Butter an 8 by 8-inch baking dish then line with two sheets of parchment, butter parchment (alternately you can just butter and lightly flour the dish if you don't care to lift out the whole cake). In a mixing bowl whisk together brown sugar, granulated sugar, cinnamon and salt. Pour in melted butter (use a spatula to scrape out any excess) and stir to combine. 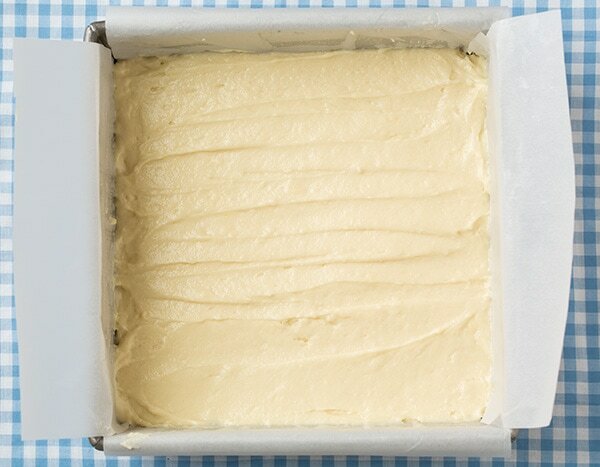 Slowly add flour while mixing with a wooden spoon or spatula, and mix until no streaks of flour remain. Set aside to rest while cake batter is prepared. In the bowl of an electric stand mixer fitted with the paddle attachment, whip together butter and granulated sugar until pale and fluffy. Mix in egg and vanilla. In liquid measuring cup used to measure milk, whisk together sour cream with milk. Add in 1/3 of the flour mixture to the butter mixture and blend just until combined, then add 1/2 of the milk mixture and mix just until combined. Repeat process once more, then end by mixing in last 1/3 of the flour mixture until nearly combined. Scape down sides and bottom of bowl using a rubber spatula and fold batter to fully incorporate. Pour batter into prepared baking dish and spread into an even layer. 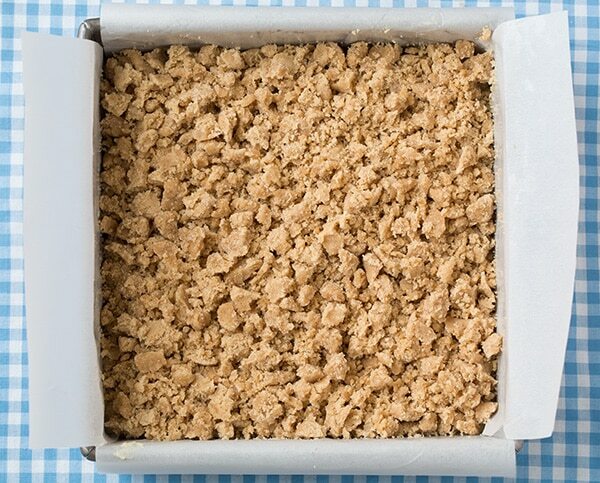 Break crumb mixture into pea size crumbs and drop evenly over batter. Bake in preheated oven until toothpick inserted into center comes out free of batter and cake doesn't sink when touched in center, about 32 - 35 minutes. Cool in cake pan 10 minutes, then using parchment overhang lift cake from pan and cool on a wire rack. Store in an airtight container.